An evaporative cooler (also known as a swampy, desert cooler and wet air cooler) is a device that cools air through the evaporation of water. Evaporative cooling differs from typical air conditioning systems, which use vapor-compression or absorption refrigeration cycles. Believe it or not, some people don’t know whether they have an evaporative cooler or a reverse cycle air conditioner. So how do you tell? If you have an evap cooler, you may have been coached to leave the door or window open. Another way to tell is the controller will normally only have a selection of fan or cool. A quick look at your roof will show a square boxed shape unit sitting on top of a duct. In an evaporative cooler a pump circulates water from the reservoir or sump on to a cooling pad which in turn becomes very wet. The pad can be one of two styles being either an Aspen or Celdeck pad. A fan draws air from outside the unit through the moistened pad. As it passes through the pad the air is cooled by evaporation. Aspen pads are made from shaved wood filings and like anything organic will slowly decay and require replacing. The length of time they will last depends mainly on how often you use the unit. But we generally find that 2 to 3 years on a commercial site is an average life expectancy. 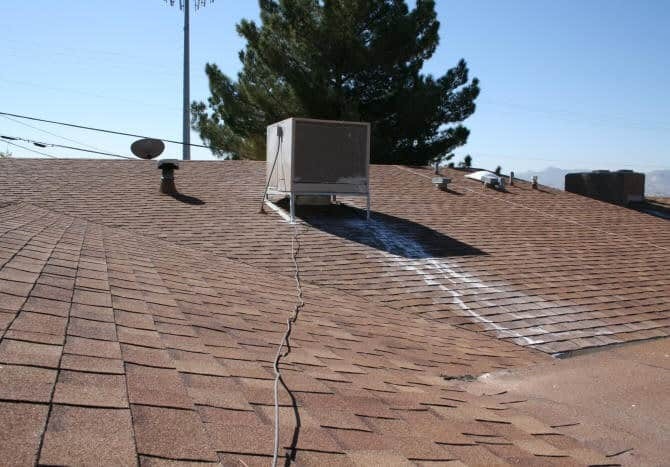 They are affordable to replace and if left in a deteriorated state are the biggest cause of water damage and leaks surrounding the use of evaporative coolers. Water damage occurs in 2 ways. When the pads rot they generally sag to the bottom leaving a gap at the top. The air flow enters the pad at the easiest point of resistance and as it accelerates through this gap it takes the water with it and it falls down into the fan motor. This can rust or even short out a motor if left long enough. But usually you will get a ceiling stain due to water dripping out of the evap cooler ductwork. These pads were generally used on older designed evaporative coolers, and we often find the water will drip on the outside of the pads and onto the roof as well. 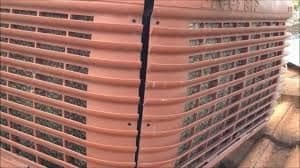 If you have a tin roof you will be susceptible to perishing of silicone joints on the flashings and this leaking water can enter the roof at these points. 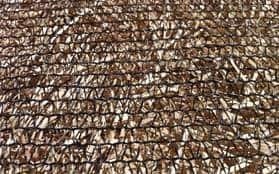 The water can also stain the roof sheet over time, making your sheets lose their protective barrier and if viewable from the ground can make the roof look terrible. For many years now “swampies” have been using Celdeck pads. These pads are super-efficient and offer maximum evaporation in comparison. 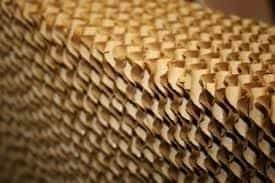 The pads resemble that of the cross section of fluted cardboard and have a much longer life expectancy of perhaps 5 years depending on usage and water quality. In areas that use bore water, this could be reduced to one year. These pads are 4 times more expensive than Aspen pads so be careful when selecting your unit if you are in a harsh water area. Another essential design improvement is an automatic drain valve. 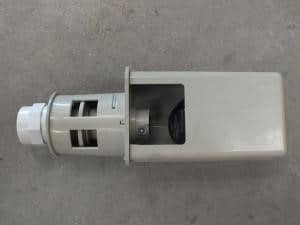 These drain valves drop the water from the unit at programmed intervals to maintain the freshest and healthiest cooler. A side affect of all that evaporation is that mineral deposits can build up in concentration over time. It is completely normal to see your evaporative cooler drop the water out occasionally and this is a great function to have. Evap coolers are a great way to cool the home cheaply, but our commercial clients use them predominantly where there are large amounts of high heat loads. These clients include gyms, sporting complexes like basketball stadiums and indoor swimming pools. Other sites include school classrooms, churches, bars, commercial kitchens and the like. Popular brands for commercial evaporative coolers include the ever-present Bonaire and its counterpart the Braemar. These tried and tested models are really the benchmark for commercial sites. We are seeing evaporative cooler installations on commercial sites where multiples of domestic model units are used. There are trade offs in using this approach as the units are cheaper to buy and are not always designed to handle the expected run hours of a commercial facility, so motor bearings can have a shortened life and then a failure is imminent. They also require more installation points on the same roof that one larger commercial unit could have done. Every roof penetration can be the source of a water leak and for a landlord that can be a lifetime of frustration on a rental property. That said there are suitable jobs for these types that include brands like Breezeair, Braemar, Bonaire, Cool Breeze, Jarrahdale, Brivis, Convair and others. Maintenance and service on any brand is relatively easy and therefor cheap.Give us a call to keep your units in top condition as without maintenance, they tend to fall apart quite quickly. As per this image to the right, the plastic clips have failed, and this will cause water wastage and leaks onto the roof. A good storm will even blow the pads clean off.